The Bulgarian Interior Ministry became the laughing stock of all Bulgarians over the so-called “police anthem,” according to a report of the German Deutschland radio. The report, filled with sarcasm, cites the singer and his critics and describes the controversial song with plenty of irony. The report further talks about the wave of criticism and indignation in Bulgaria after the airing of the show and cites Bulgarians saying the performance is a reminiscence of the times of the Communist rule in Bulgaria and a sign the country is turning into a police State, all while Bulgarian policemen have the reputation of being aggressive and corrupt. “One year ago, Boyko Borisov, a former police general, became Prime Minister of Bulgaria and since then the special task forces often surprise people with actions that remind of Hollywood movies. Arrests of mafia bosses and corrupt former ministers are aired life on TV, but the police do not have much to brag about – the number of burglaries and grand-theft auto is on the rise, while reports of police violence are coming more and more often,” Deutschland radio points out. 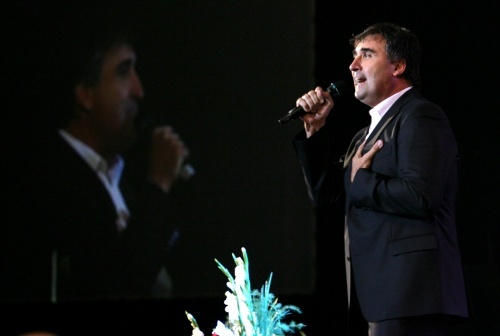 Veselin Marinov is also cited defending the song and saying that Bulgarians are used to disparage anything and everything. The radio report further talks about the Facebook group called “Let’s Help Veselin Marinov to Stop Singing” and quotes the many satiric versions of the song’s text.